Concrete walls can be made in a couple of basic ways. Either some sort of pre-cast method like tilt slab or factory made, or they can be cast-insitu, that is forms are built on site in the correct place and the wet concrete is placed or poured into the wall formwork. 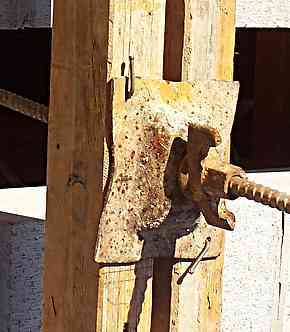 Wall Formwork - A proprietary formwork wall tie rod system. Here is the outer face of a lift well under construction. The double vertical soldiers have been stood up loosely in position, and the horizontals are yet to be slipped in behind them. Wall Formwork - A close up of the bolt that goes all through the wall. Wall Formwork - PVC sleeve and cones over thread bar. Wall Formwork - Cone left after formwork stripped. Hole may be cemented up after cone flicked out. The bolts are made out of high tensile steel. They have a very low rounded and course thread profile. This is to make them fast to use and easy to clean. The nuts are large and are able to be tightened and undone with a hammer. The large washers are designed to spread the load, typically across to adjoining timbers. The washers have extra holes for nails to secure them to the timbers. To keep the forms the correct distance apart a plastic PVC pipe sleeve is cut to length and plastic cones are put onto the end. 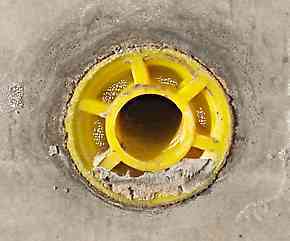 When the rods are withdrawn and the formwork stripped, the plastic sleeve is left behind, but the cones can be flipped out and the hole is patched with cement mortar. Any new section of the wall or slab edge concrete formwork will use the holes left in the previous concrete to firmly fix the next layer of formwork, with speedbolts again. These speedbolts are the best thing since sliced bread. Compare them to what we had to use before they came out. See below. A concrete formwork system for walls without any real proprietary formwork specific manufactured items. Wall Formwork - Mild steel black tie wire. 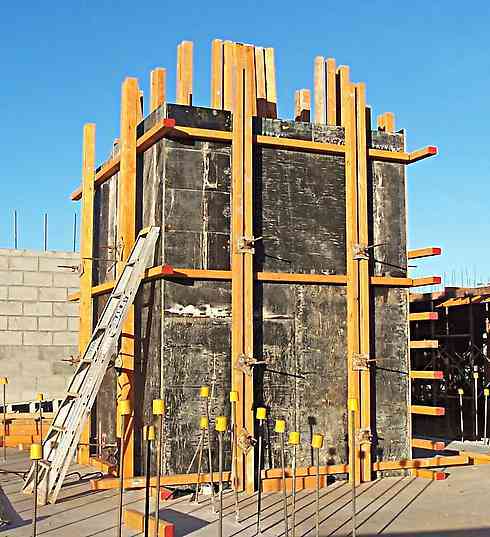 Wall Formwork - Timber wall forms. Wall Formwork - twisting the wire. We had form ply, 3 x 2 timber, 6 x 4 timber and odd and sods of lighter stuff for bracing. No purpose made wall forms, no proprietary bolts, clamps, or metal fitting at all. We had nails and an abundance of that magic stuff. Tie wire. In effect we made everything in our concrete formwork system. Tie wire is simply thin and soft mild steel malleable wire that steel fixers use for tying and holding reinforcing steel in place. The tool for tie wire is a pair of end cutting pliers or nips. In a single strand tie wire is fairly weak, but when say ten strands are twisted together you are getting close to a wire rope that is say 5mm dia and as such it is strong enough to resist a fair amount of pressure. When we had the footings for the wall poured, we formed up and poured a kicker. This is a wall that is only 75 to 100 high, and it's purpose is to accurately establish the bottom of the wall, and give the next stage of the concrete something to clamp to, to stop any possible movement. It is far easier to establish the true position of the wall like this with a small kicker, rather than try to push and a maneuver large heavy wall forms. The kicker of course was poured with the same quality of concrete as the rest of the wall, with the same scabbling and cleaning of the surface where the new concrete was to join to the old. The wall forms themselves were clamped tightly to the kicker . From memory most of the walls we did like this were 300 to 500 thick. Mind you it wouldn't have mattered if the walls were a lot thicker, The pressure on the forms is the same, for a given depth. The soldiers (verticals) were about 3 or 4 ft apart. The reason we could use a simple system of tie wire to hold the forms in position was that we only went up in stages of about 900 a pour. Not too much pressure. We drilled pairs of holes through the ply, on each side of the soldiers (heavy vertical timbers), and pushed say 6 or 8 strands of wire through. Pulling them as tight as possible by hand and then twisting them together. We then tightened them up with timber wedges. The packer is there to stop the wire biting into the wedge and stopping it working properly. 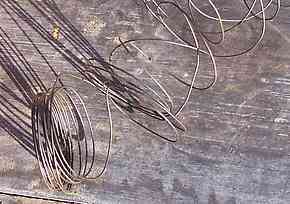 A unique property of tie wire is that once it is twisted around itself it does not want to unravel again. Even to the point of breaking, it will not come undone if it has been twisted half a dozen times. A simpler way of tensioning the wire is by using a tourniquet. Or as it is sometimes known as, a Spanish windless. Once the wires have been passed through the ply and around the soldiers and secured, a lever (small offcut of reo steel, or a screwdriver etc.) is placed between them and used to twist the wire around itself, drawing the two ends together. Again the unique properties of tie wire work to our advantage. When pressure is taken off the lever or the lever is removed the wire stays as is, just as tight as before. No amount of pressure will make it unravel. It will break first. So if we had enough room we reached down the form and put in a tourniquet, or we put one at the top, with a spacer the same length as the thickness of the wall to stop us pulling the forms too tight. Just an aside about tie wire. I have done a fair bit of traveling on rough roads and in out of the way places, and I always have a roll of tie wire and a pair of end cutters among my tools. It is just amazing the amount of things you can fix temporarily with it in an emergency. Even on modern multi-storey construction, it is still possible to see the odd bit of concrete formwork held with tie-wire. Other Wall Form Methods, Acrow "U Form"
The only other method that I have used for forming up walls,is a system of steel framed standard sized panels, that have (replaceable when needed) ply face inserts, called Acrow "U form". Acrow as far as I know fired up in 1936 and have been making, selling and hiring concrete formwork related materials ever since then. Wall Formwork - The walls to this box culvert were formed with Acrow "U" form panels. 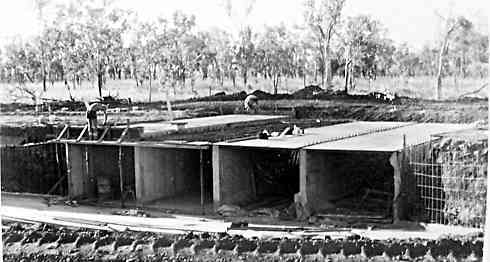 We did a few of these cast in-situ (cast on site, as opposed to pre-cast) box culverts under the Stuart Highway many years ago, using "U" forms for the walls. Since then apart from small odd jobs I have always used this system. Working efficiently I have hired "U form", set it up, poured the concrete, stripped the forms, cleaned them and returned it all to depot inside the minimum weekly hire period. This on a quite large retaining / fence wall to a suburban house block. It is very quick and easy to use. The panels are clipped together with a key and wedge system, with metal snap ties for the wall thickness. The forms are straightened with standard scaffold pipes clipped to them. Just a hammer and a bit of scrap bar is all that is needed to fix or strip this system. No special tools. I have no photos at present, but check back soon and I'll post some, because this is the way way to go for many jobs, if you have access to the hire of this product of course. Go To Top :Wall formwork. Old fart's off topic rant. When I had been doing concrete formwork for a few months only, at the age of twenty one, I was the only carpenter on a job where we started off in trenches up to 30 ft deep, and built reinforced concrete retaining walls out of the ground, prior to the construction of a large wallpaper factory. The site foreman was an apprentice carpenter 18 years old who was classed as a junior GF (general foreman). The main GF came around about once a day. Now that's what I call on the job training. Contrast the training that lad got, with the situation with large companies today that work entirely with sub-contract labour. Multiplex comes to mind. They are forced by the government here in Australia to employ apprentices, so the lads they employ are all first year, and put to running errands and sweeping up because the company does not employ any carpenters on wages that can give them on site training. So when I am rabbiting on about the old days when we all used inches and feet, that's what I think in and that's what I use. Simple really.